Jay: Hey, Citie. What are you up to this weekend? Anything fun? Citie: Nothing concrete. But I have a crazy idea about going to Antartica. Citie: Yeah, I just really want to see some penguins. Citie: Penguins, Jay! I wanna see penguins! 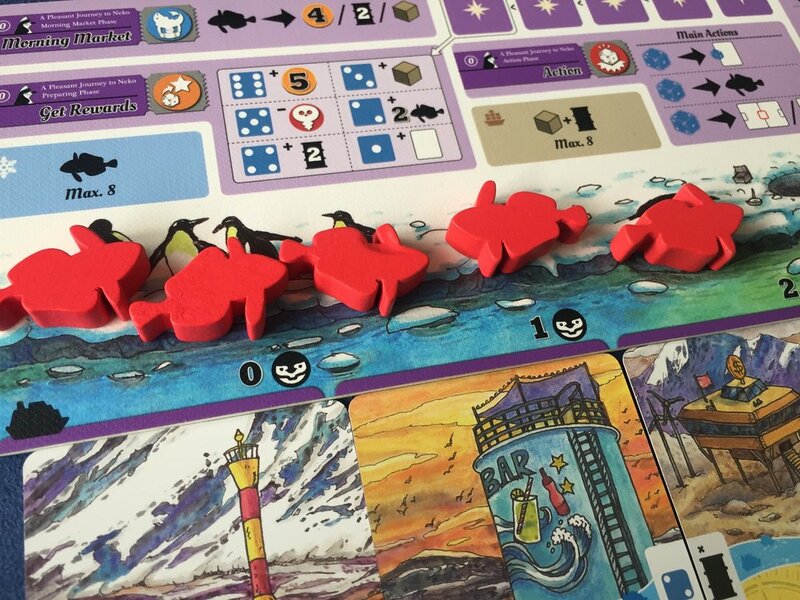 A Pleasant Journey to Neko is a dice drafting strategy game, and yes, there are penguins. The rule book informs you that you and your friends have decided to journey to Neko Harbour in Antarctica to see penguins—as one does. Cardboard East ranked A Pleasant Journey to Neko the 7th best Asian board game of 2018—making it the 4th best game out of Taiwan in 2018. Let’s take a deep dive into APJTN to explain why so many gamers across the world have taken the pilgrimage to Neko. PENGUINS! …cards! Let the bidding commence! Wow! Citie Lo has been reviewing games on his blog for several years now, and it shows. He knew what to do, and more importantly, he knew what not to do. The components are not only bright and colorful but also are different shapes and sizes. The mid-game scoring tiles and very different from the interference (pollution) tiles. There are three denominations of currency; each is a different size, color, and artwork. Again, the Taiwanese white cardboard works extremely well here helps bring focus to the fabulous and colorful card art. Even the wood tokens are top notch. The fish don’t have the classic fish look and look like actual fish. The 3D anchors are sturdy enough to actually stand upright. The ships are just the right size to sit comfortably on the dice and in-between cards. The fuel tokens are different is size, shape, and color from the cargo tokens. A lot of detail went into the components and it really shows. And ALL of this art was done by Citie Lo himself. APJTN is played over 2 periods. (Each period consists of 2 rounds, so there will be 4 rounds in total.) After each period, there will be a scoring phase with some card effects triggering at the very end for end game scoring. Whoever has the most Penguin Points (Victory Points) will be the winner. (Yes, PP jokes were made.) Each round consists of 4 phases: (1) Morning Market, (2) Preparation, (3) Action, and (4) Round End. Morning Market: Players may sell any number of fish. Each fish sells for $4, 2 oil barrels, or 1 goods token. This proves important for certain strategies as the morning market provides a better deal than later in the round. It’s also one of the few ways to get goods tokens. Preparation: Players will draft dice and arrange them on their player boards from least to highest. After 6 dice have been drafted, players will choose one to discard as income. (eg - Citie discards a 6 and gets $6 from the bank.) The player with the highest total will go first that round, will break all ties, and will receive an interference (pollution) tile—negative points if not dealt with later. Certain cards with “Income” icons will trigger and players will receive their rewards—usually money or oil barrels. The lowest rolled die will also allow players to receive certain bonuses; the lower the die the more choices players have available to them. Actions: This is where the game is. Players will be using the recently drafted die to bid on cards, trigger purchased card abilities, or trade for fish. During this phase, players will have several free actions; they don’t involve dice. These free actions revolve around resource management, moving your ships across your cards to trigger abilities, ridding yourself of pollution, buying more boats, or buying more lanes for cards (each lane only holds 5 cards). I’ve seen players go up to 3 lanes in one game. If you ever see 4 lanes, then you’re doing something wrong to let your opponent get away with that. End of Round: At the end of the round, the card bidding (which uses a similar system to Key Flower) will be resolved, new cards will be dealt out to the board, certain card abilities will trigger. If this all sounded weird to you, you’re not alone. APJTN is a unique gaming experience. In the decades of my life I’ve spent gaming, I hadn’t experienced something like APJTN. Not only is the gameplay unique, but the theme isn’t one I’ve seen used too often if not at all. APJTN is an odd game. There is a significant amount of narrative dissonance in the presentation and gameplay. What you see and what you expect is very different than what you get. The box cover is reminiscent of box art from Alea games from 8 years ago, (eg - Castles of Burgundy, Puerto Rice, Bora Bora, Norte Dame, Glen More) and just like those games, the cover did not do the game justice. The board game community has been brainwashed into thinking that all euro games of significance must have neutral color palettes, be void of theme, and follow the same box art conventions of years past. NO MORE. Thankfully, APJTN does away with this by showcasing a bright and colorful game; however, the subconscious discrimination still exists and I’m certain it was, in part, detrimental to sales. The biggest complaint I have about APJTN is that it did not come with dice trays to pass the dice around the table. Drafting dice is just cumbersome to begin with and passing them while avoiding dropping them in a chaotic fashion, while not impossible, is taxing. The Wood Games invested in white cardboard and unique wooden components. Adding dice drafting trays should have been a priority as they are the number one thing you should buy after you purchase this game. There didn’t need to be so many harbour or ship tokens. It would have been nice to see that money allocated elsewhere. APJTN is an incredibly tight game. There are powerful combinations to explore, but not all combos will be present during each game—especially with 2 and 3 players. There are several powerful cards, but players won’t have many opportunities to use them. This makes gameplay tight and very focused. APJTN does begin to fall apart in the fourth round. None of the cards you bid on can be used for anything other than points. The first round isn’t stressful and the choices (at first glance) don’t look too meaningful. This puts the bulk of the game on the second and third rounds of gameplay. Rounds two and three almost always determine who will win the game. Occasionally smart play in the 4th round can turn the tide but not often. This usually leaves gamers wanting a bit more. The game abruptly ends just as the decisions begin to get deep and interesting. It can leave a bittersweet taste for some gamers. In a four-player game, you should see most if not all of the cards. This is disappointing and gamers who like to deep dive into games should be wary as this affects re-playability. I would have liked to have seen a few more cards. Thankfully, the game is easily expandable and has already seen a mini-expansion and a few promos. There are also advanced play variants to explore. I strongly recommend the advanced cards, but I strongly don’t recommend the advanced bidding. The advanced cards simply give bonus points for focusing on collecting similar cards—excellent. The advanced bidding eliminates the random input of the bidding and allows players to choose which cards to bid on. I found this to be less fun as it decreases player interaction and increases AP. I do NOT agree with the 45-90 minute game time. If all players involved had played before and were not prone to AP in any way, then yes, it would be possible. That is not the case for most of the games of APJTN I’ve played. This is partly due to APJTN having a unique gaming system that is prone to AP. Several card powers and how they’re labeled aren’t too intuitive as well, and I have yet to have a game where we didn’t need to look up how a card worked. Thankfully there’s a big appendix in the back of the manual with very clear instructions. There’s no other way to say it. APJTN is an odd game. Not in a bad way, but I can honestly say that I’ve never played a game quite like it. There’s dice drafting, bidding, tableau/engine building, resource management, networking, logistics, an environmental message, penguins, and fish—lots and lots of fish. Best of all, it works—really well. DAMN WELL. The player boards are a bit busy at first; however, they are incredibly clear and easy to read. You may have thought penguins were the theme of APJTN, but the real theme is “clarity”. The iconography on the player boards and player aids was clear, helpful, and intuitive. Some of the iconography on the cards took a few rules referencing, but thankfully there’s an excellent appendix in the back of the rule book. Coins of different denominations were different sizes, colors, and had different art. FANTASTIC. Cards that gave abilities had tokens to help players remember if the abilities had triggered—one side colored, the other side in black and white. PERFECT. The white cardboard really brightens the entire game and complements the hand-drawn art perfectly. It really is a joy to look at. Each round players draft dice and use them in different ways: bidding on cards, buying more resources, extending logistic lines, moving ships down those lines, and more. The game plays over 4 rounds and plays in about 25 minutes per (experienced) player. While round 1 tends to not be that exciting, rounds 2 and 3 really sing and give each player an ocean of tight and difficult decisions to navigate through. The game almost falls apart in the fourth round as none of the acquired cards can be used for anything other than scoring; it definitely makes you feel the game ends just a tad too early. All that being said, I commend APJTN for doing so much in such a tight amount of time and being something truly unique in the gaming world—a rarity these days. I would have liked to have seen more cards, but what is there gives players quite a bit to explore each game. Depending on what cards come out and when, there are quite a few strategies to explore and a decent amount of re-playability. You also get a strong sense of how much testing went into this game to ensure that the cards were well balanced and well thought out. APJTN is medium to high weight Eurogame with a unique story. Citie Lo has done a remarkable job for his first game design; he even did the art and the publication. Expect to see more great things from this one man gaming machine in the years to come! As 2019 moves along, I find myself playing A Pleasant Journey to Neko more and more often. I’m sure I’ll come back to my Top 10 games of 2018 in a few years to re-evaluate which games have held up through the test of time. I’m confident A Pleasant Journey to Neko won’t be going anywhere. It’s that good. Gamer: Cardboard East STRONGLY recommends A Pleasant Journey to Neko for gamers who enjoy tight strategy games that reward experienced play. The blending of dice drafting, bidding, and card/resource management is not only excellently done; it’s uniquely done. If you’re looking for a mid to heavy euro that plays unlike any other you’ve played before, I strongly recommend you check this out. It even scales well. Family: Cardboard East does NOT recommend A Pleasant Journey to Neko for family game nights due to its unique gameplay. APJTN is a gamers’ game. It’s just a tad bit too complicated for non-gamers. I do see this as a nice stepping stone if you’re building up to games like A Feast for Odin, Lorenzo il Magnifico, or Troyes. Party: Cardboard East does NOT recommend A Pleasant Journey to Neko for the party environment; however it is simple enough for experienced gamers to enjoy with a glass of their favorite booze. In fact, I recently won my last game of APJTN with two mimosas. Sunday brunch game days are the best!